BOSTON — Cleveland pitcher Shane Bieber was sure to thank fellow rookie Greg Allen for making his debut at Fenway Park a successful one. Allen slid to a stop as he caught the ball over his shoulder — it was a sacrifice fly and finished Bieber, but thwarted Boston’s momentum. “That dude’s like a ballhog out there. 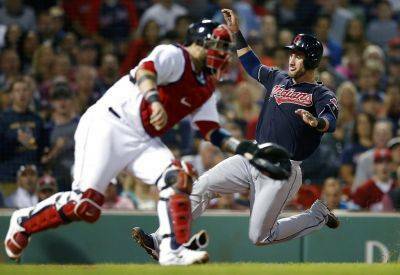 He wants everything,” said catcher Yan Gomes, whose solo homer in the eighth also helped simmer down the Boston fans. “We’re not swinging the bat well right now,” manager Alex Cora said. Manager Terry Francona said it’s great to see young players like Bieber and Allen, who extended his hitting streak to 14, play so well in a big series, but it’s still the regular season. “We just wanted to win tonight. That’s all,” Francona said. Indians: DH Edwin Encarnacion, out since Aug. 12 with a right wrist contusion, could be activated from the DL Thursday for the last of the four-game series. Francona said Encarnacion is close, but the Indians won’t rush to get him back in the lineup. “He’s doing so good that we just want to do the right thing,” Francona said.